Dubai, UAE, 7 February 2019: Today, Facebook announced that it will be launching third-party fact-checking in Arabic, in partnership with Agence France-Presse (AFP) MENA. This partnership will not only help fund the fact-checking work that AFP will do on Facebook, but help them in their efforts to combat false news off the platform as well. 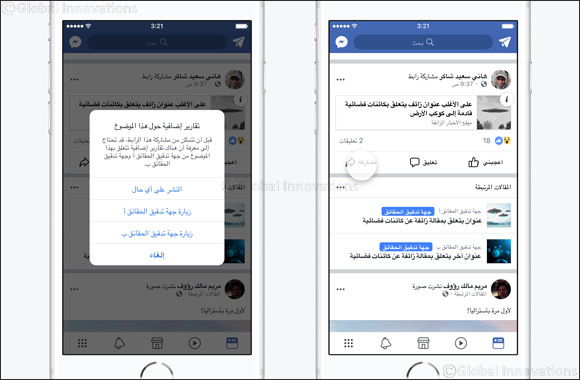 Facebook’s new Arabic fact-checking program will begin to roll out this year with the aim to reduce the spread of misinformation, whilst improving the quality of news people find on its platform. As with all of Facebook's partners in the program across the world, AFP is part of a global network of fact-checking organizations, certified by the non-partisan International Fact-Checking Network. Arabic-speaking AFP fact-checkers will tap the additional expertise of local journalism bureaus across MENA to fact-check Arabic-language content on Facebook. And will follow a standard set of criteria when determining the veracity of stories. When third-party fact-checkers write articles about a piece of content, Facebook will show these in Related Articles immediately below the story in News Feed. Page Admins and people on Facebook will also receive notifications if they try to share a post or have shared one in the past that's been determined to be false, empowering people to decide for themselves what to read, trust, and share. This program is in line with Facebook’s three-part framework to improve the quality and authenticity of stories in the News Feed, wherein Facebook removes accounts and content that violate its Community Standards or ad policies, reduces the distribution of false news and inauthentic content like clickbait, and informs people by giving them more context on the posts they see. Facebook's fact-checking program, which now covers content in 17 languages, also relies on feedback from the Facebook community, as a signal to raise potentially false stories to fact-checkers for review. Articles will be fact-checked alongside the verification of photos and videos. If one of Facebook’s fact-checking partners identifies a story as false, it will appear lower in News Feed, significantly reducing its distribution. 'We are delighted to extend our fact-checking project with Facebook into the Middle East and beyond. Information verification is at the heart of AFP’s mission and its expertise and is something that our clients benefit from daily in this era of fake news and disinformation,” said Phil Chetwynd, AFP Global News Director. “This new contract with Facebook to the Middle East and Africa marks an important new step for AFP, the leading international news agency in Arabic,” added Rita Daou, the Head of AFP's Arabic service and the Agency's Deputy Middle East Editor. Facebook started the third-party fact-checking program in December 2016 and has grown to include 35 partners including AFP. As a major media partner in the program, AFP brings in-depth expertise of local journalism leveraging their widely spread bureaus across MENA to fact-check Arabic-language content on Facebook.